The heat transfer fluid (usually water) and fresh water are pumped throughout the building. Pumps vibrate and create noise as they move water. Pumps are also located in a central mechanical room. Architects are notorious for locating these rooms in the worst possible place in a building, usually adjacent to the office of someone important. Even if the equipment room is in a remote location, noise and vibration may be transmitted through the pipes and annoy someone in a different area of the building. These problems can be most infuriating to HVAC or plumbing consulting engineers because when the building is nearly finished and may even be occupied, changes at this point in a project are generally expensive and result in very unhappy owners. 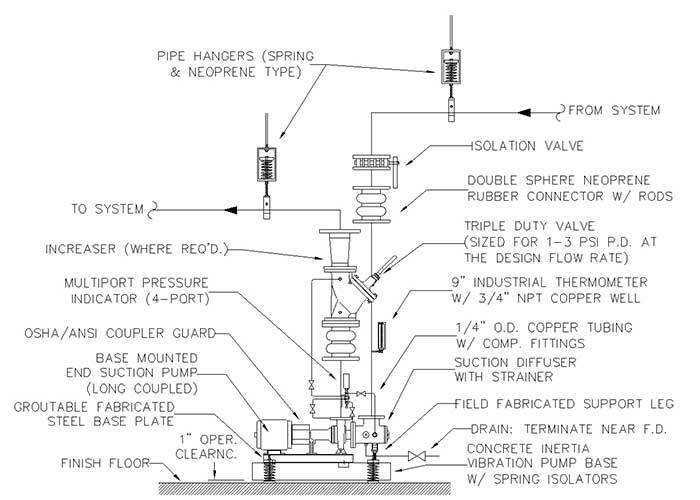 The key to effectively minimizing pump noise and vibration is to properly isolate the equipment in the design stage of a project, as shown in Image 1. Noise and vibration alone is not necessarily a problem. There must be three elements present to make it a problem: a source (the pump or other rotating equipment), a path (the piping or structure) and a receiver (the building occupants). Take away any of the three elements, and the problem cannot exist. There are two paths for vibration transmission from a pump: through the building structure and through the piping. This article will focus on noise and vibration transmitted through the attached piping. Typically, engineers will specify springs or rubber pads to isolate the pumps from the building structure. For piping, there are several choices. A specifier may choose a hose-and-braid assembly. Other options available are rubber or polytetrafluoroethylene (PTFE) connectors. Which option is best for vibration isolation through the piping? HVAC and plumbing systems normally operate at relatively low pressures and temperatures, which make them perfect candidates for elastomeric connectors. Stainless hose and braid and elastomeric connectors are all commonly seen in equipment rooms. Here is how elastomeric connectors compare with stainless hose and braid for vibration isolation. Hose-and-braid connectors consist of stainless steel or bronze corrugated hose with stainless or bronze braid (see Image 2). These connectors can have various end fittings (flange, weld, threaded, grooved or a combination) and can handle higher temperatures and pressures. Hose-and-braid connectors do not subject the mating pipe ends to hydrostatic end loads. Stainless or bronze connectors are intended to be a life-of-system product, meaning that no periodic inspection or maintenance is required. These connectors are designed for lateral movement only and cannot handle axial movement unless they are combined into a loop assembly. Also, manufacturers require minimum lengths for effective vibration isolation. PTFE couplings are occasionally used for vibration isolation (see Image 3). PTFE is a fluoropolymer capable of higher temperatures and pressures and can be used with many corrosive fluids that would be unsuitable for metal or other elastomers. These connectors are flanged, with integral control rods to limit the movement. Elastomeric couplings are usually flanged, with either spool or spherical-type bodies (see Images 4 through 6). Several types of elastomer compounds are available, with neoprene and ethylene propylene diene monomer (EPDM) the most common material for HVAC or plumbing systems. Standard construction consists of three main layers: the tube, reinforcing plies and cover. Spool-type bodies have full-face flanges with internal wire reinforcement or specially designed reinforcing flanges. Spherical joints have a bead seal and are constructed without additional reinforcement. Control rods are usually installed with this type of connector, and the mating flanges can be subject to considerable pressure thrust loads. Elastomeric couplings are generally not life-of-building products and must be periodically inspected and replaced.